Not only is Obama bankrupting America, he’s bankrupting the DNC. According to Democratic National Committee (DNC) Chair Debbie Wasserman Schultz (D-Fla.), Democrats are “in the red” because they spent more than “everything we had” to get Barack Obama and others elected last November. To fraudulently re-elect Barack Obama took all they had and then some more. In short, the DNC knows the game. Get your people scared EARLY, and start collecting. Just look at the list of losers they list as “wins,” and that should scare you enough to get in the game. 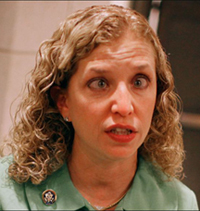 Wasserman-Schultz even gets in a point for “deficit spending,” because for Democrats, the ends justifies the means. But know that they may spend THEIR CONSTITUENTS’ money without restraint, they certainly won’t do that in their personal lives. To read more from Kevin Jackson, visit TheBlackSphere.net.